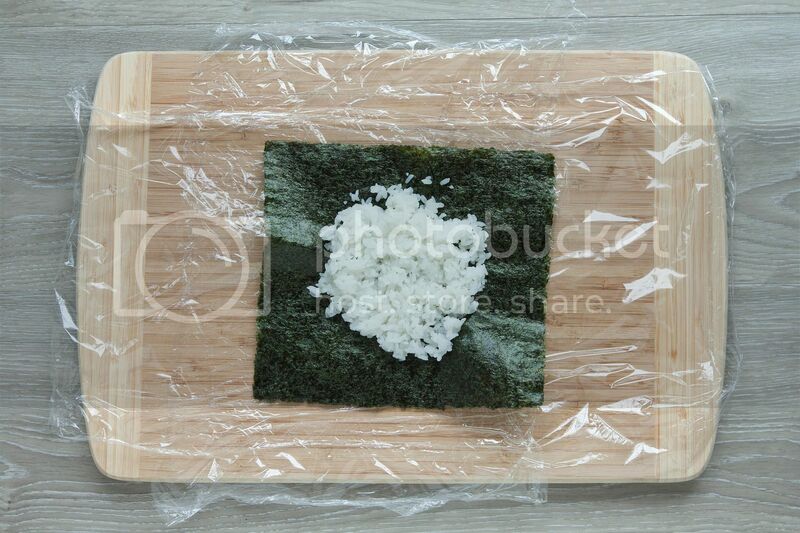 Onigiri is the common Japanese rice ball formed by both hands, you can find more detailed descriptions from one of my old recipes here: Japanese onigiri two ways. "Onigirazu" on the other hand, is more like a rice sandwich. You make it by layering up ingredients on the cling foil then wrap everything by bringing all four foil corners together to tighten the ingredients. 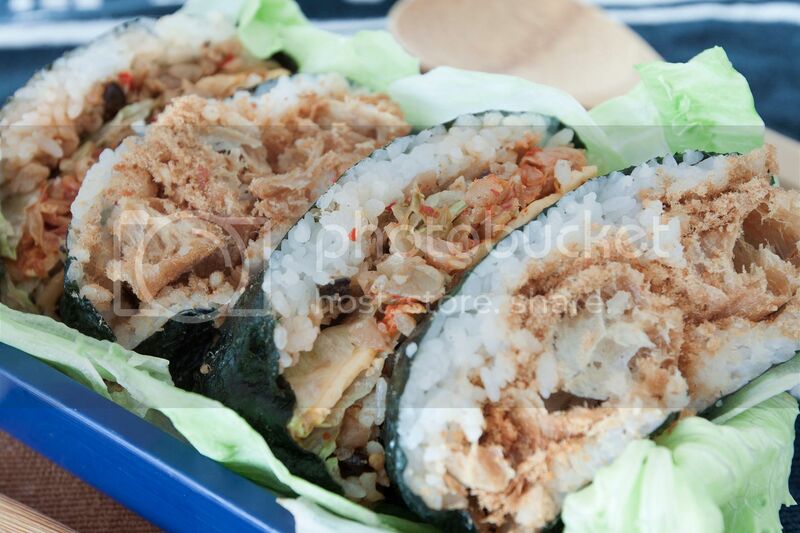 The encased rice ball will then cut in half, showing all the nicely layered ingredients just like a sandwich. Still confused? Hope these step-by-step pictures will help a little. Ingredients (1 to 2 portions)? Cook about 2 cups of white rice. The actual amount depends on the size of the dried seaweed sheets. 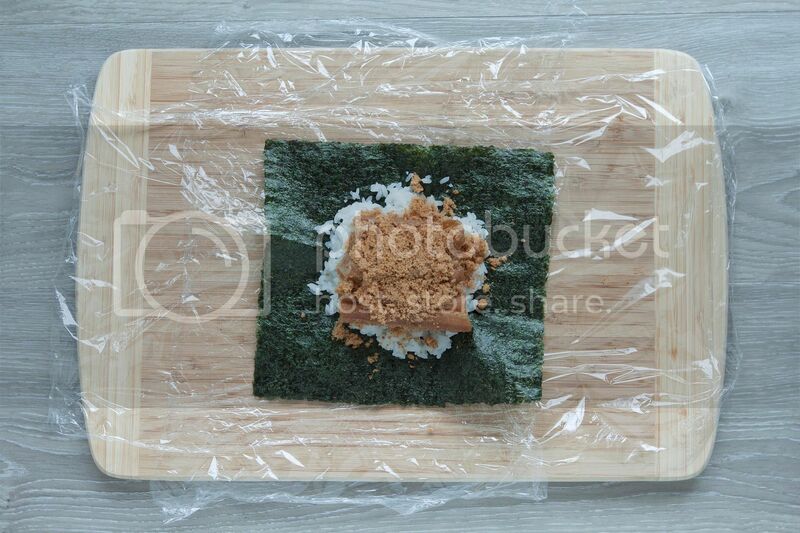 Lay a sheet of cling foil on the surface and put one dried seaweed sheet in the center. Scoop some rice to the center. I used too much rice so it can get tricky when folding in the seaweed. First timers, try to start with smaller amount of rice at least for few rounds of practices, otherwise the onigirazu might explode when attempting to fold in the corners.. Finish with one more layer of white rice. The key here is try to start and finish with layers of rice. Fold in all four seaweed sheet corners, making sure no ingredients are peeking through. You'll see why starting out with smaller amount of rice is a good idea. To me, folding in all the corners without the rice ball exploding is the hardest part. Wait for five minutes before cutting. Dip the knife in hot water and dry with a kitchen towel. 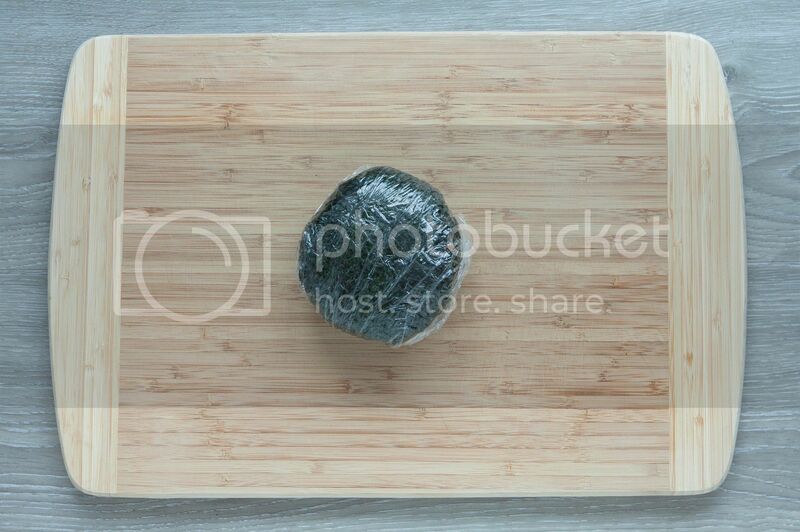 Cut the onigirazu in half with cling foil attached. Once done, you can leave the foil to better hold up the shape or remove before serving. Seaweed sheet, rice, ground pork stir fry, lettuce, kimchi, Cheddar cheese square, lettuce, ground pork stir fry, rice. Sounds like a lot and it sure took me quite an effort to keep the rice ball from exploding. The final product was worth it though, packed with flavors, savory ground pork, spicy kimchi, creamy cheese, and all. 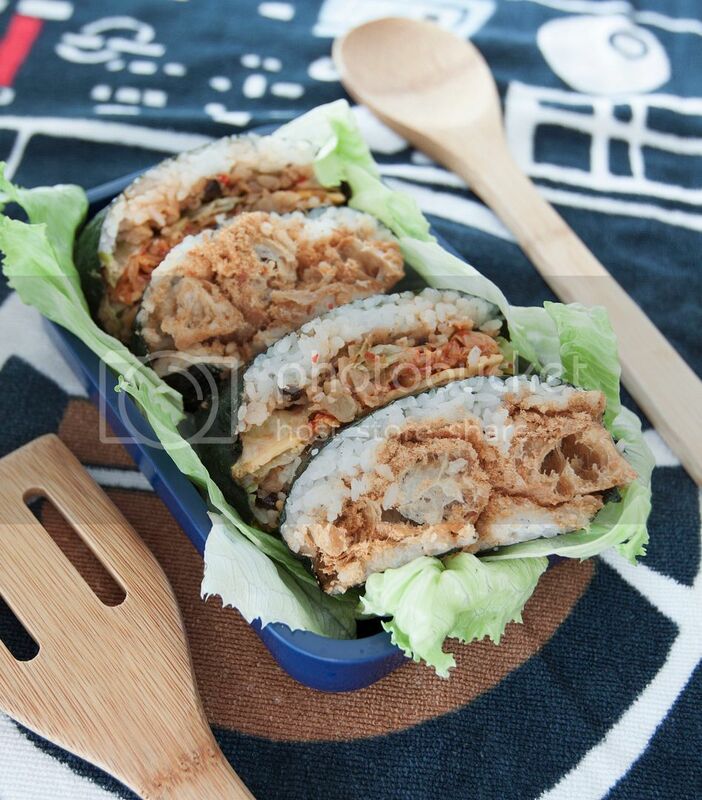 Onigirazu is gaining its popularity recently especially it's easier to make compared to onigiri. As long as you get a hang of the portion that can withhold by the seaweed, you'll have even more fun trying to mix and match all sorts of ingredients. The best part follows after cutting the onigirazu in half, seeing all the work comes to life with these pretty and appetizing layers. Stay tuned for more flavor varieties. You can also explore some other possibilities and create colorful layers by using carrot, cucumber, ham, corn, and more. Let you be the artist.